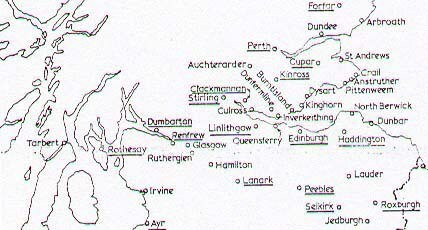 Scottish Parish records show that my eighth great grandfather, David Spence, was born in Dysart, Fife, Scotland April 5, 1639(1) and was christened April 16, 1639 in Dysart, Fife, Scotland. (2) His father John David Spens (1611-1659) had two marriages. The first to Helen Mitchell (1612-1633) on February 19, 1628 in Dunfermline, Fife, Scotland(3) produced two children. 2. James Spens, who was christened March 25, 1632 in Dunfermline, Fife, Scotland. (6) I have no additional information about him. Helen Mitchell’s (7) name was erroneously transcribed as Helen Morris years ago. This explains the reason why I could find nothing about her. Helen Mitchell’s father was James Mitchell, who was christened in Dunfermline July 26, 1584(8), and she was a child of his first wife, whose name is unknown. Helen Mitchell Spens died about 1632-1633. (9) Her line reconnects with the Spence family later. And finally, the parents of David Mitchell (b. 1541) were David Mitchell (b. 1520 in Scotland) and Isabel (b. 1520). (27) This is where the Mitchell line makes another connection with the Spens/Spence family. d. ANN ROE (1640-1711)—THE WIFE OF DAVID SPENCE (1639-1679). (38) Ann will reappear later in the David Spence article. A cousin relationship not only existed between DAVID SPENCE and ANN ROE, but a cousin relationship also existed with JAMES DASHIELL. David Spence, Ann Roe and James Dashiell will return in the David Spence article. Patrick Spens/Spence was a first cousin of David Spence (b. 1639-1679). 6. John David Spens/Spence (1611-1659) (43)—the subject under discussion here. (1) Microfilm of Scottish Christening Records, International Genealogical Index, Family History Library, Provo, Utah. Date Accessed: 1995. (6) Scotland, Select Births and Baptisms, 1564-1950 about James Spens, Ancestry.com, Provo, Utah. Date Accessed: September 8, 2014. Available online at http://www.ancestry.com. (7) International Genealogical Index, Family History Library, Provo, Utah. Date Accessed: 1998. (16)International Genealogical Index, Family History Library, Provo, Utah. Date Accessed: 1998. (18)International Genealogical Index, Family History Library, Provo, Utah. Date Accessed: 1998. (19)International Genealogical Index, Family History Library, Provo, Utah. Date Accessed: 1998. (20)International Genealogical Index, Family History Library, Provo, Utah. Date Accessed: 1998. (21)International Genealogical Index, Family History Library, Provo, Utah. Date Accessed: 1998. (22)International Genealogical Index, Family History Library, Provo, Utah. Date Accessed: 1998. (23)International Genealogical Index, Family History Library, Provo, Utah. Date Accessed: 1998. (24)International Genealogical Index, Family History Library, Provo, Utah. Date Accessed: 1998. (25)International Genealogical Index, Family History Library, Provo, Utah. Date Accessed: 1998. (26)International Genealogical Index, Family History Library, Provo, Utah. Date Accessed: 1998. (27)International Genealogical Index, Family History Library, Provo, Utah. Date Accessed: 1998. (28)International Genealogical Index, Family History Library, Provo, Utah. Date Accessed: 1998. (29)International Genealogical Index, Family History Library, Provo, Utah. Date Accessed: 1998. (30)International Genealogical Index, Family History Library, Provo, Utah. Date Accessed: 1998. (31)International Genealogical Index, Family History Library, Provo, Utah. Date Accessed: 1998. (32)Microfilm of Scottish Christening Records, International Genealogical Index, Family History Library, Provo, Utah, Date Accessed: 1995. (34)International Genealogical Index, Family History Library, Provo, Utah. Date Accessed: 1998. (35)International Genealogical Index, Family History Library, Provo, Utah. Date Accessed: 1998. (36)International Genealogical Index, Family History Library, Provo, Utah. Date Accessed: 1998. (37)International Genealogical Index, Family History Library, Provo, Utah. Date Accessed: 1998. (38)International Genealogical Index, Family History Library, Provo, Utah. Date Accessed: 1998. (40)International Genealogical Index, Family History Library, Provo, Utah. Date Accessed: 1998. (41)International Genealogical Index, Family History Library, Provo, Utah. Date Accessed: 1998. (42)International Genealogical Index, Family History Library, Provo, Utah. Date Accessed: 1998. (43)International Genealogical Index, Family History Library, Provo, Utah. Date Accessed: 1998. (44)International Genealogical Index, Family History Library, Provo, Utah. Date Accessed: 1998. (46)International Genealogical Index, Family History Library, Provo, Utah. Date Accessed: 1998. (50)Microfilm of Scottish Christening Records, International Genealogical Index, Family History Library, Provo, Utah. Date Accessed: 1995.